This exclusive tour includes 3 days on the fabulous winter Kizhi Island. 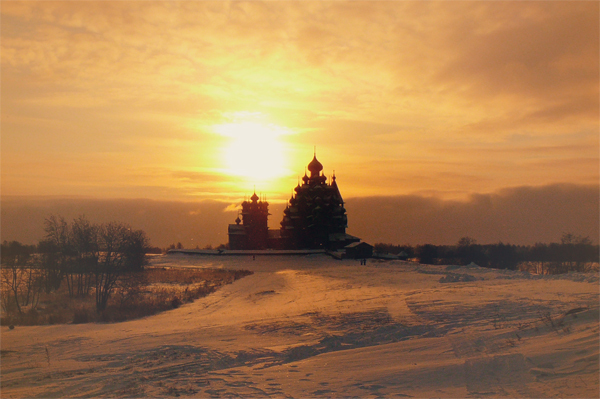 Winter on Kizhi Island is a very special season. Crispy colors, peace, tranquility of winter landscapes and dark silhouettes of the churches create the scenery of rare beauty and attract photographers from all over the world. 18:00 Departure from St.Petersburg by train. 22:52 Arrival in Petrozavodsk, where the guide meets you at the railway station. Accommodation at Park Inn by Radisson. Night in Petrozavodsk. 10:30 Meeting with the guide. City tour of Petrozavodsk. 12:30 Departure for Kizhi Island by hovercarft. It will take about an hour and a half to cross the Onego Lake and to reach the fabulus Kizhi Island. 14:00 Arrival on Kizhi Island. We will spend the next two nights not far from the famous wooden church ensemble. Our accommodation is in a cozy guest house built according to the traditions of the Russian wooden architecture. 15:00 After lunch in the guest house we head to the main exhibition of the Kizhi Museum to get acquainted with the most interesting sights of the island. After the excurison we have free time to photograph the churches in the seting sun. In the evening we enjoy hot sauna and substantial dinner. Today we start early in the morning and devote the whole day to photography. In the morning we come back to the Kizhi Ensemble to take pictures in the morning light. 12:00 Lunch. After lunch we walk to the other side of Kizhi Island, where two inhabited villages are situated. From the highest point of Kizhi Island we will enjoy a breathtaking panorama of the Kizhi skerries and the silhouettes of the Kizhi multidomed churches from afar. Sauna and dinner in the evening. Free time in the morning to take pictures of the places, which you. 13:30 Arrival in Petrozavodsk. Transfer to the railway station. The guesthouse is located on Kizhi Island not far from the famous Kizhi churches. It was built of huge pine logs according to the traditions of Russian wooden architecture. The house can accommodate 5 people maximum (1 twin room + 1 triple room) with all modern conveniences (2 WC and 1 shower). Clothes : warm clothes, good shoes, several pairs of socks (comfortable and warm enough to spend several hours outdoors), warm woolen hat, gloves or mittens, scarf. Photo Equipment: spare batteries, memory cards, tripod and remote release (for taking pictures of the sky and northern lights). Miscellaneous: nasal spray and all the necessary medicines you usually take in case of a cold. Please note: Hovercrafts have weight restrictions. That is why we kindly ask you to make sure you can fit everything inside a carry on case and a smaller bag. Big bags and suitcases can be left in Petrozavodsk in the luggage room.